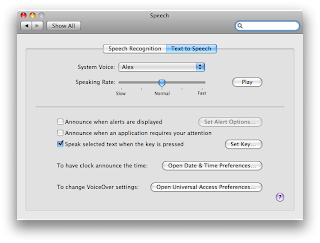 I just wrote about using the text to speech capabilities with Alex yesterday and already I have found a use for "him" that is very cool and I want to share with you. Have you ever had to write a significant e-mail that you read through several times before sending out? How about a blog post, or even a comment that will be published on the web for all to see? You know the kind: you want to make sure you are sending the right message and that it reads well. What I started doing yesterday has become something that I think I’ll be doing all the time moving forward. Highlight the text right before you hit Send or Publish and let Alex read it back to you. Does it read Okay? Is your sentence structure clear? As the author of the text you write you will probably have the tendency to gloss right over a phrase that is difficult to read because you don’t see it the same way. I’ve found that if I let Alex read over it I get a chance to hear what my words will really sound like before I even show them to others. For this purpose I have assigned the Command-Option-S key combination to my friend Alex. He reads it back to me before I send it off and I get a sense for what my words actually sound like. Thanks Alex!